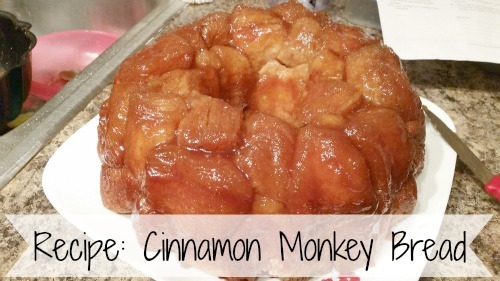 I absolutely love monkey bread and it is so super quick and easy to bake that I just had to share with you this recipe! It is literally like 5 quick and easy steps. What you'll need: 1 fluted tube pan (12 cup), plastic storage food bag, and something to grease the pan with. 1. 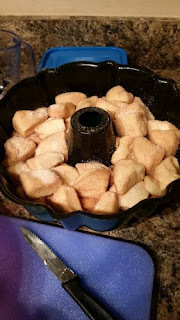 Preheat oven to 350 F and lightly grease the pan with a shortening or cooking spray (I use Pam) and in a large plastic bag mix the granulated sugar and cinnamon. 2. Start to melt your butter if you haven't already and then open biscuit tubes and cut each biscuit in quarters, toss in bag to thoroughly coat each biscuit in the cinnamon sugar mixture. Arrange pieces in the pan. 3. Mix the brown sugar and melted butter (this is why you should melt the butter while doing the above step) and pour over the biscuit pieces. 4. Bake for about 28-32 mins or until they are golden brown and no longer doughy in the center (use a toothpick or fork). Let it cool in the pan for a few mins and then turn it upside down onto your serving dish! Cut or pull-apart to serve while its still warm.